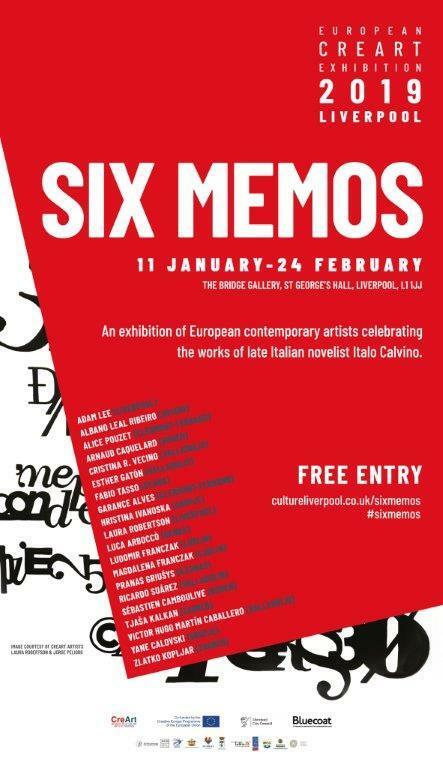 The CreArt Exhibition Six Memos will be presented from January 11 at the Bridge Gallery, St George's Hall, in Liverpool. 20 European creators participate in the collective exhibition, selected by the Croatian curator, Branca Benčić. Six Memos is based on the unfinished and posthumous work of Italian novelist Italo Calvino: Six proposals for the next millennium. The works of the artists point to fractures and potentialities with the background ideas of Six proposals, create associations and new meanings, through the use of different media, such as photography, video, drawing, painting, objects, installation or text. The artists examine the notions of the landscape, the changing nature, the human condition, the relationship between subjects and objects, the artistic production itself, identity and memory.